Visa is extending its Visa Token Service platform to auto manufacturers to enable in-vehicle payment experiences through Visa Checkout. The company has partnered with Honda and car parking solutions provider ParkWhiz to demonstrate fuel and parking proof-of-concept solutions at Mobile World Congress in Barcelona this week. 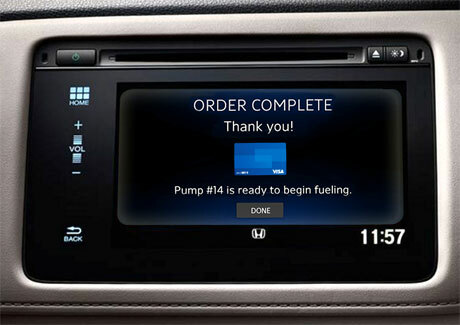 “The fuel app detects when the car is low on fuel and navigates the driver to nearby gas stations,” Visa says. “Once parked next to the pump, the app knows the exact amount of gas needed to fill the tank and can calculate the cost to fill up. The driver can also purchase store items with full integration of discounts and loyalty or rewards programs. The companies expect to test the fuel app concept in northern California and the parking app concept in New York, both over a three month period in the spring. Visa demonstrated a proof-of-concept car system that let drivers order and pay for pizza from Pizza Hut inside their vehicle at Mobile World Congress 2015.